As soon as we saw these stunning Birch trees we knew we had found our range of wedding trees – they complement beautifully any wedding theme adding freshness and a beauty that only natural wedding trees can bring. We wanted to introduce a hire range of smaller trees, trees that could fit in to smaller venues, venues with low ceilings, marquees… any small spaces that people wanted to get married in. 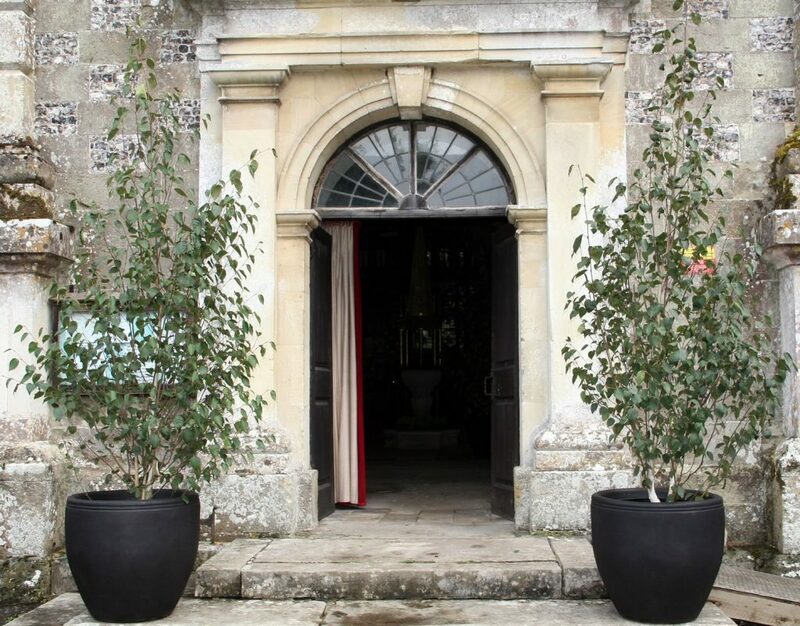 These multi-stemmed Birch trees are our solution for beautiful wedding trees to hire for smaller spaces, the newer branches having a rich orange/red peeling bark that changes into a glorious white lower down the tree. 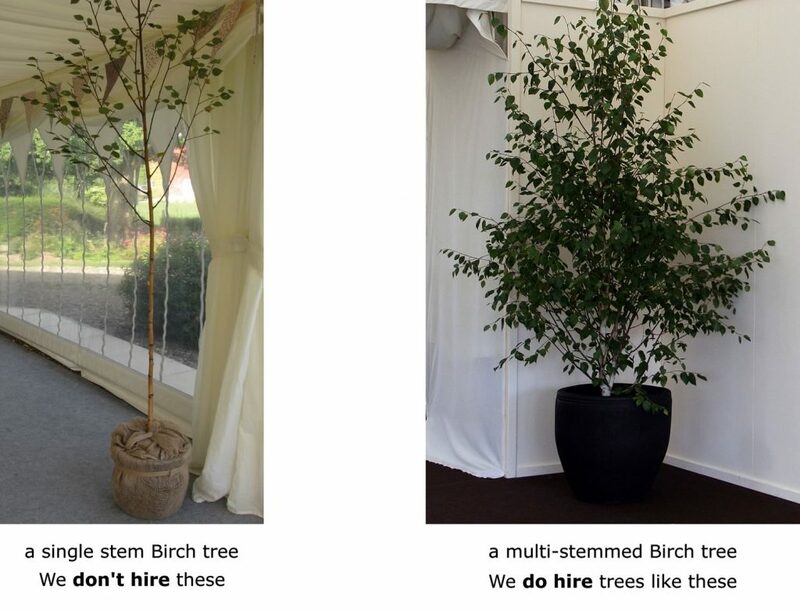 It is usually the bride who phones to enquire about tree hire for weddings and we get asked some standard questions, which is understandable if you have never hired wedding trees before. We hope this guide to hiring trees for weddings will help. The first thing to remember is, it is your wedding so don’t worry about what other couples do or have done in the past or what the experts say. We say, make it your day, plan it your way. Despite what the “wedding experts” say there is no such thing as a wedding tree. However, there are certain types of trees, plants and traditions which have become associated with weddings. As a greenery hire company we have to carefully monitor requests and trends in order to assess what to stock. So it will not come as a surprise to learn that the most requested trees were Birch trees and Olive trees. With topiary plants for weddings that want a more formal look. Have said all that we probably supply bamboo to more than 40 weddings a year so people can and do experiment! Wet hire venue = a venue which has many aspects available in house e.g. staffing, catering, audio-visual equipment etc. This type of venue will already be pretty “busy” from a visual point a view, so unless you need to hire a tree lined avenue you probably won’t want large quantities of trees. Dry hire venue = a venue which is a blank canvas and you decide what happens within the space. A blank canvas, how fab. There is no right amount of trees to hire for a venue and the look that you want will determine how many trees and what size of tree you need to hire. If there was a “right amount of trees to hire” then most suppliers would do the usual clichéd Bronze, Silver or Gold packages. If you need help in working out how many trees you need, ask your supplier for suggestions but before you call them try to get hold of a floor plan. Why? Because there are tens of thousands of wedding venues in the UK and no one supplier will know every venue. A floor plan will help you to plan your wedding and assist a supplier to help you. Event suppliers in certain sectors don’t have any real standardisation, the better the supplier the better the end product. That means a 3M tall tree can vary from a twig to a beautiful specimen tree, so you need to compare like for like. Below is an example of an apple and pears comparison of two Birch trees – the tree on the right is supplied by ourselves and the other by… who knows. Once you have decided on a supplier book early. Especially relevant if you are having a wedding during the peak season (April – November) – all the best suppliers get booked up very quickly. Think night time lighting up the trees will add impact or if you have a wedding taking place in the late autumn or winter consider up lighting these trees as the white bark lends itself to adding lighting, just drop dead gorgeous.